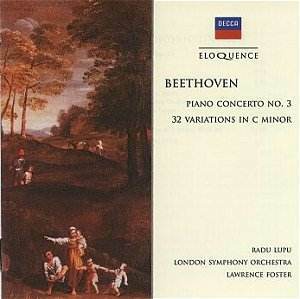 This disc is one of four releases on the budget-priced Eloquence label containing Radu Lupu�s 1970s recordings of all five Beethoven Piano Concertos. Lupu�s performances were widely acclaimed when they first appeared, and it is good to see them back in circulation. They were taped variously between 1971 (No 3) and 1980 (No 1, the only digital recording in the set) and, with the exception of this disc of No 3, featured the Israel Philharmonic Orchestra, conducted by Zubin Mehta. In fact Eloquence proudly proclaim these other discs (with their prominent photo-logo of Mehta) to be part of their �Zubin Mehta Edition�, thereby attributing (by implication) the lion�s share of the honours to the conductor rather than the soloist! The complete series is gathered together as follows. Nos 1 and 4 share one (well-filled) disc: 466 707-2. The rest are coupled with a variety of other Beethoven orchestral or piano music. No 2 includes (very generously) an almost complete Prometheus, on 466 681-2. This disc of No 3 (fittingly, but far from generously) is topped up with the 32 Variations on an Original Theme. No 5, the so-called �Emperor�, is followed by a short (but agreeably self-contained) recital comprising the two Op 51 Rondos, and the two two-movement Sonatas of Op 49: 466 689-2. The two missing pieces from this list are the so-called �Triple Concerto� (Op 56 in C major, for piano, violin, cello and orchestra) and the �Choral Fantasy� (Op 80 in C minor, for piano, chorus and orchestra). So far as I am aware, Lupu has not recorded these, but readers wishing to complete their collection may wish to note that (very usefully) they can be found together on the Eloquence (Philips) label � the number is 464 368-2. Arrau is the pianist in the former, with Szeryng and Starker, and conducted by Inbal: the latter comes from the complete Brendel-Haitink set. The Third Concerto is quintessential Beethoven, recalling as it does Mozart�s Piano Concerto (K491) in the same key, of which Beethoven famously declared "we shall never be able to do anything like that!" The two pieces share the same anxiety and intensity, even though the younger composer was yet to experience the desolation we hear so uncomfortably in K491. Beethoven is his own man, though, and time and time again breaks away from convention. How telling the pianissimo timpani are as the soloist winds up his cadenza in the first movement � and how atmospheric it is in this recording, with the hard drumsticks distinct but distant behind that blanket of strings. How daringly Beethoven explores the remote key of E major for his hymn-like slow movement � and how sonorous it is in Lupu�s hands! And how cleverly Beethoven plunges back into a restless C minor for the finale � G sharp, remember, is the same black note as A flat � and how quickly Lupu responds! Lupu�s Third was, as I�ve already said, his first** Beethoven Concerto recording � made in London, and (the LSO being a notch or two above the Israel Philharmonic as an ensemble) perhaps the better for it! Even so, a high degree of polish is no substitute for real characterisation: at the end of the day, it is the slightly anonymous orchestral contribution which limits the effectiveness of these performances. Regrettably, the same is true of Mehta (in varying degrees) in the other issues in this series. The 32 (very short) Variations on a (not very) Original Theme � also in C minor � are written (or rather they�re best regarded as having been written) in one long paragraph. Lupu plays them with fire and colour, and (most importantly) ploughs through all the double bars with far-sighted determination. The approach works well. The CD booklet declares the running time to be 49' 23": they probably hoped you wouldn�t notice! In fact, there are only a miserly 47' 20" here: even Mozart�s biggest Concerto � the one without which Beethoven�s Third may never have seen the light of day � could have been accommodated here, instead of the Variations. What are they thinking about, offering us such small portions? his first Decca recording (1971), with Lawrence Foster.